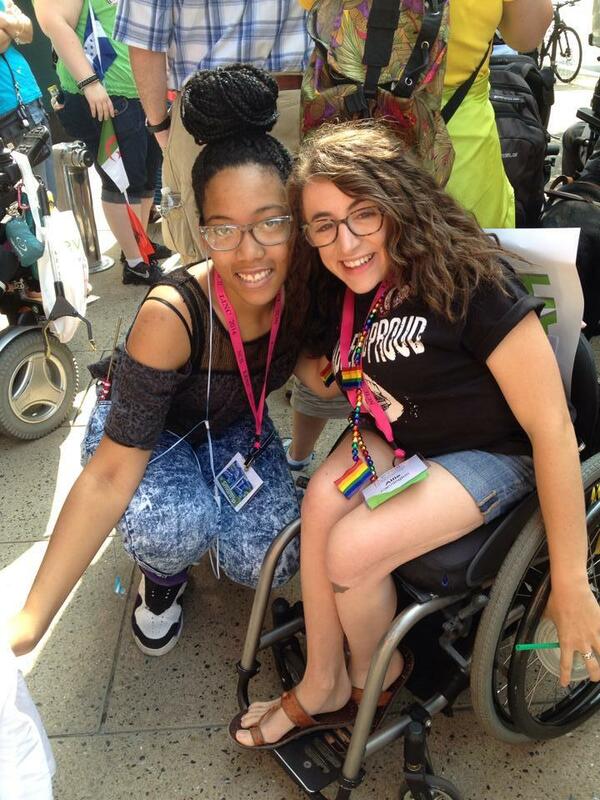 NCIL’s 2014 Annual Conference on Independent Living was epic. Stalwart leaders and energetic new voices came together from across the nation to celebrate recent victories and plan for the future of America’s Independent Living Program. Seven hundred Conference participants were joined by hundreds of additional fierce and fired-up advocates as we marched to the US Capitol to thank Congress for establishing a new Independent Living Administration and demand that the Senate act now to ratify the UN Convention on the Rights of Persons with Disabilities (CRPD). We chose the conference theme of Prevail almost a year ago, when the Independent Living Administration was still only a glimmer of hope. Celebration was in the air this year, as the Independent Living Administration is becoming a reality in just a few short months. NCIL members interacted directly with Administration officials who have the power to influence the issues we care about most, including U.S. Transportation Secretary Anthony Foxx; Assistant Secretary for Aging and Administrator for the Administration for Community Living Kathy Greenlee; Rehabilitation Services Administration Commissioner Janet LaBreck; Administration for Community Living Principal Deputy Administrator Sharon Lewis; and Senate staff members Bill Knudsen, Michael Gamel-McCormick and Lee Perselay. While Senator Harkin joined us for several events as usual, his speeches were anything but. He told the crowd of advocates that although 2014 is his last year as a Senator, he will never leave us and that he will now fight by our side, “shoulder to shoulder”. At the Awards Luncheon, he tossed his script aside and told the audience stories of his favorite times with NCIL and ADAPT. We want to thank each and every one of the 725 advocates that registered and attended NCIL’s 2014 Annual Conference on Independent Living. This year’s conference was outstanding because of your presence and participation. Please read on for further details. If you attended the Conference but did not submit an evaluation on-site, please take a few moments to tell us about your experience. We are very happy to announce that all 4,870 pictures from NCIL’s 2014 Annual Conference on Independent Living are now available on Flickr. We apologize that we do not have the capacity or knowledge to caption every picture. If you see a picture of yourself or others you know, please caption it for the benefit of all. New this year: we’ve created an album of select (captioned) photos that capture the overall feel of the 2014 Annual Conference. If you would like a specific photo added to this collection, please caption the photo in the comments or email eleanor@ncil.org with the image number and a description. You can comment on photos using a Flickr / Yahoo account, with an option to comment via Google or Facebook. Special thanks to Tom Olin for his amazing photos and dedication to our Movement and its documentation. And, as always, thanks to our members, who made these photographs what they are: the story of our people gathering in our nation’s Capital to bring about equality and freedom for people with disabilities! The 2014 Rally was one of the most successful in NCIL’s history, with amazing speakers and a huge turnout of dedicated advocates. There was a lot of excitement and celebration around the recent accomplishments of our movement, including the recent passage of the Workforce Innovation and Opportunity Act (WIOA). But there was also a call for action on other issues important to the disability community, including access to community living in accordance with the Olmstead decision, ratification of the U.N. Convention on the Rights of Persons with Disabilities (CRPD), further inclusion of youth in the IL Movement, and the ABLE Act. After the rally, NCIL members stormed the hill to visit their elected officials. Nearly every member of Congress was visited by NCIL advocates from their home districts to push for action on pressing legislation that impacts people with disabilities nationwide. The NCIL March, Rally, and Hill visits are always at the heart of the NCIL Conference, and 2014 exceeded all expectations. NCIL thanks our advocates for making this year such a huge success! The youth presence went beyond the three meet ups, as many of the youth leaders attended NCIL workshops, events, legislative meetings, and the rally and march. And regardless of where or when, the youth voices were profound and passionate; probing difficult questions and sharing creative ways to better the disability community and Independent Living. As the Conference came to a close and the youth leaders went back home, they are getting ready to join the Youth Caucus and other NCIL Committees. Keep a look out for what the Youth Caucus has in store for 2015! During our week at NCIL’s 2014 Annual Conference on Independent Living advocating for CareerACCESS, a series of programs and supports designed to make it easier for young adults with disabilities to find and hold a job, it was evident that it had the support of those for whom it was designed. In fact, a group of approximately 10 such young adults, with backgrounds in law, advocacy, the nonprofit sector, and research enthusiastically joined up with the CareerACCESS initiative when they learned what it was about. Yet based on many conversations that the CareerAccess team had with directors of government agencies, think tanks, and nonprofits it was also evident that the higher-ups would need to hear from those supporters before anything could move forward. Now, the conference is over, but the youth team continues to work toward the implementation of CareerACCESS. Twenty-year-old Tailor, a student at American University and intern at 2Gether-International is interested in researching and compiling a policy report, which will make the case for CareerACCESS. Daniel, an employee of Paraquad, a Missouri Center for Independent Living, spoke about the importance of CareerACCESS at a meeting involving key leaders of federal agencies including the Department Of Education, Social Security, and Health and Human Services, and is now connecting with young adults in his area to garner more support. Systems Change Advocate Andy Arias of Orange County California spoke with several representatives from his state, inspiring many to ask how they could help. He has also volunteered to help raise funds for CareerACCESS to move forward. I also spoke to Congresswoman Barbara Lee’s staff, and defended my resolution, calling upon NCIL to advocate for the elimination of the inability to work test in determining Social Security eligibility, which ultimately got adopted. CareerACCESS has passed the taste test, but it cannot go forward without public support, so we need people like you to lend a hand. Our blog at www.ourCareerACCESS.org, where young adults with disabilities write about the barriers that the current system has placed in their path to economic self-sufficiency always needs more entries. Please contact us if you are interested in sharing your story. Members of Congress also need to know that their constituents support these kinds of reforms. Finally, the initiative always needs more supporters, so make sure that your friends and family know about the issues in Social Security for young adults with disabilities and the solutions proposed by CareerACCESS. Elections for officers to NCIL’s Governing Board were first on the agenda. Mark Derry of Morgantown, West Virginia, longtime Chair of NCIL’s Civil Rights Subcommittee, was re-elected to the position of Vice-President. Ann McDaniel, Executive Director of the West Virginia SILC, was elected to serve as Secretary. Stan Holbrook of Pittsburgh, Pennsylvania was re-elected to serve as the Diversity Chairperson. The Diversity Chair is a member of NCIL’s Governing Board and Executive Committee. Cliff Perez, Systems Advocate at the Independent Living Center of the Hudson Valley in Troy, NY was re-elected to represent Region 2 (New Jersey, New York, Puerto Rico, Virgin Islands). Pat Puckett, Executive Director of the Georgia SILC was elected to represent Region 4 (Alabama, Florida, Georgia, Kentucky, Mississippi, North Carolina, South Carolina, Tennessee). Diana Garrett, Executive Director of Dynamic Independence, a CIL in Bartlesville, OK, was elected to serve as the Region 6 representative (Arkansas, Louisiana, New Mexico, Oklahoma, Texas). Tami Hoar, Program Director at the Montana Independent Living Project (MILP), in Butte, MT was re-elected to represent Region 8 (Colorado, Montana, North Dakota, South Dakota, Utah, Wyoming). Doug Toelle, Advocacy Director at Access Alaska, was re-elected to continue his service as the representative of Region 10 (Alaska, Idaho, Oregon, Washington). Darrel Christenson, Director of Community Integration at Arizona Bridge to Independent Living (ABIL) in Phoenix, Arizona. Paula McElwee, Technical Assistance Coordinator for ILRU in Houston, Texas. Brian Peters, Housing Advocate at IndependenceFirst in Milwaukee, Wisconsin. The Awards Banquet is a very special event at the NCIL Conference every year. The banquet is our opportunity to come together as a community and thank advocates and allies that have fought tough battles during the past year to advance the rights and independence of people with disabilities. Diana Viets Award: Sukhwa Glick, and Danny Raede and Hayden Mears of www.aspergersexperts.com.